You are buying Abbott PediaSure Vanilla Retail 8oz Bottle Each, model #58049. ADW Diabetes offers a complete line of dietary supplements for both children and adults. 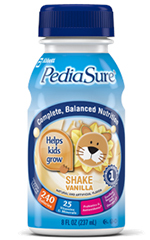 The Abbott PediaSure Vanilla Retail 8oz Bottle provides a source of complete, balanced nutrition designed especially for children 1 to 13 years of age. The #1 pediatrician-recommended brand, PediaSure is clinically proven to help kids grow. There are PediaSure formulations for oral and tube feeding as well as formulations available with and without fiber. PediaSure products, when used in appropriate amounts with the appropriate patients, may be used as a sole source of nutrition or as a supplement, and is WIC®-eligible in all 50 states. 1.0 Cal per mL, 240 Cal per 8 fl oz, from a balanced distribution of protein, fat, and carbohydrate. Meets 100% of the 2011 updated Dietary Reference Intake (DRI) values for calcium and vitamin D for children 2-8 years of age in 1000 mL and for children 9-13 years of age in 1500 mL. Prebiotics designed to support digestive tract health and antioxidants to support the immune system. Excellent source of DHA omega-3 to help support brain and eye health. Consult your health care professional for use with children under 2 years of age. Water, Sugar, Corn Maltodextrin, Milk Protein Concentrate, High Oleic Safflower Oil, Canola Oil, Soy Protein Isolate. Less than 0.5% of the Following: Short-Chain Fructooligosaccharides, Natural & Artificial Flavor, Cellulose Gel, Potassium Chloride, Magnesium Phosphate, Potassium Citrate, Calcium Phosphate, Tuna Oil, Calcium Carbonate, Potassium Phosphate, Salt, Cellulose Gum, Choline Chloride, Ascorbic Acid, Soy Lecithin, Monoglycerides, Potassium Hydroxide, m-Inositol, Carrageenan, Taurine, Ferrous Sulfate, dl-Alpha-Tocopheryl Acetate, L-Carnitine, Zinc Sulfate, Calcium Pantothenate, Niacinamide, Manganese Sulfate, Thiamine Chloride Hydrochloride, Pyridoxine Hydrochloride, Riboflavin, Lutein, Cupric Sulfate, Vitamin A Palmitate, Folic Acid, Chromium Chloride, Biotin, Potassium Iodide, Sodium Selenate, Sodium Molybdate, Phylloquinone, Vitamin D3, and Cyanocobalamin.